In addition juniper berries help clear congestion so are often included in cold remedies to relieve congestion and improve breathing Indeed, juniper berries have such a wide range of uses that no herbal medicine chest should be without them. Preparation Methods & Dosage : To prevent loss of essential oil, juniper berries should not be ground, crushed, or rubbed until just before use. Juniper essential oil is for external applications only. 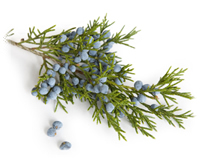 Juniper Side Effects: Not for use during pregnancy or where there is kidney disease. If your urine smells like violets, you have been using the herb too long. Continued overdose can cause kidney irritation and blood in the urine. Use juniper berry essential oils in external applications only. 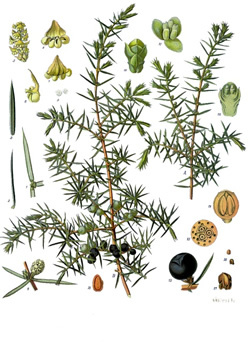 The Juniper is a small shrub, 4 to 6 feet high, widely distributed throughout the Northern Hemisphere. Juniper belongs to a variable genus of about 50 species, many of which are planted as ornamentals. Many varieties on sale at the nursery are propagated from male plants and do not bear the medicinal berries valued in herbalism.